If you’re on the lookout for a high-performance multivitamin for women, EVL NUTRITION WOMEN’S MULTIVITAMIN should be up to the daunting task. You’ll see for yourself it’s one of the most comprehensive women’s multivitamins in this review. Comprehensive. Gives the likes of Optimum Nutrition Opti-Women a serious run for its money. Specialty ingredients. Help take women’s health to the next level. No “All-Natural” or “GMP” label. Could be a dead giveaway this product has fillers. Other Ingredients: Microcrystalline Cellulose, Magnesium Stearate, Sodium Starch Glycolate, Silicon Dioxide, HPMC (vegetable cellulose), Propylene Glycol, Triacetin. Directions: As a dietary supplement, consume 2 tablets daily with a glass of water. The modern woman lives a busy and active lifestyle. Juggling work and family responsibilities can be challenging at times. Many of these ladies also work out at the gym on a regular basis. On this note, keeping track of their nutritional intake can be a daunting task. That’s why taking a top-notch multivitamin is so important in filling those nutrition gaps. Perhaps the best women’s multivitamin we’ve sized up is 21st Century Mega Multi For Women. Women will surely benefit from its insane B vitamin levels (it has a whopping 5,333 percent of the daily value for vitamin B1. A minimum daily value of at least 15 percent is high). In terms of comprehensiveness, Optimum Nutrition Opti-Women gets the nod. You can’t go wrong with its 17 specialty ingredients which include the likes of dong quai, chasteberry, uva ursi, ALA, butcher’s broom (powdered), and ostivone. A product which covers all the bases should help boost long-term health. Supplementing with EVL NUTRITION WOMEN’S MULTIVITAMIN should complement a woman’s active lifestyle. Let’s see if EVL NUTRITION WOMEN’S MULTIVITAMIN can do that for you and more. The manufacturer dubs it its “High-Performance Multivitamin” for women, per its official website. We like that. It seems to us this is the kind of multivitamin today’s active woman needs. If it exceeds expectations, it should be another worthy addition to your growing supplement stack. Since we found none of the aforementioned labels on EVL NUTRITION WOMEN’S MULTIVITAMIN, it could contain synthetic ingredients. That raises a red flag. Make sure your multivitamin has one of these labels to assure you it provides your body with all-natural ingredients. Your body deserves only the best. While hard-training athletes need sufficient iron, antioxidants (vitamin C, vitamin E, beta carotene, and selenium), calcium, and vitamin D to perform at peak levels (we recommend top-notch multivitamins such as Country Life Max For Men and EFX Sports VitaDrive), women need a certain array of vitamins and minerals for optimum health. “Adequate vitamin D and calcium nutrition throughout life may reduce the risk of osteoporosis, and calcium supplementation during pregnancy may reduce preeclampsia and low birth weight. To reduce neutral tube defects, additional folic acid and possibly vitamin B12 need to be provided to non-deficient women before they know they are pregnant. This is best achieved by fortifying a staple food. It is unclear whether maternal vitamin A supplementation will lead to improve health outcomes for mother or child. Iron, iodine, and zinc supplementation are widely needed for deficient women,” per the February 28, 2011 issue of Nutrition Research And Practice (via NCBI.NLM.NIH.gov). Calcium and vitamin D: Some studies reveal there are possible links between premenstrual syndrome (PMS) and insufficient calcium consumption. “Adequate vitamin D and calcium nutrition throughout the life course appear to reduce the risk of osteoporosis,” per the aforementioned Nutrition Research and Practice study. Iron: Women are more prone to iron deficiency than men “because of monthly blood losses during their reproductive years, and the 10 percent who lose the most (>80 ml/mo) are most at risk,” per the study. Zinc: The study linked zinc deficiency to maternal mental issues such as depression and anorexia nervosa. Based on the criteria, the above table clearly shows 21st Century Mega Multi For Women as the best multivitamin among the the three we compared: it reigns supreme in terms of calcium, iron, vitamin A, and vitamin E content. Does this mean EVL NUTRITION WOMEN’s MULTIVITAMIN is a slouch? Not by a long shot. We say its essential vitamin and mineral arsenal for women should help the ladies achieve optimum long-term health in conjunction with regular exercise, sound nutrition, and enough sleep. On the other hand, EVL NUTRITION WOMEN’S MULTIVITAMIN is teeming with B vitamins. It has an insane 4,167 percent of the daily value for vitamin B12 (methylcobalamin) for increased antioxidant protection and energy levels as well as improved nervous and cardiovascular system function. It also has a solid amount of folic acid (vitamin B9) at 150 percent of the daily value. Folic acid is another crucial vitamin for women. “Folic acid prevents neural tube defects in babies when women take it before and during early pregnancy,” per Dr. Larry Appel, director of the John Hopkins Welch Center for Prevention, Epidemiology, and Clinical Research. The same source recommends women consume at least 400 micrograms of folic acid daily. EVL NUTRITION WOMEN’S MULTIVITAMIN’s 600 micrograms of folic acid per serving should be up to the daunting task. “Women who are or might become pregnant should get 400 mcg/day of folic acid from fortified foods or a prenatal supplement to reduce the risk of neural tube defects such as spina bifida,” per registered dietician Katie Ferraro of the American Council on Exercise. 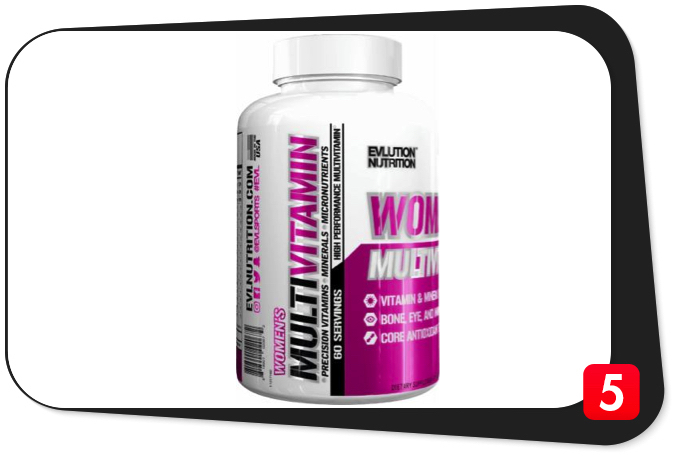 EVLUTION NUTRITION WOMEN’S MULTIVITAMIN’s specialty ingredients take up approximately 332.52 milligrams per two-capsule serving. Here, you’ll find additional health-boosting components which shape the identity of this multivitamin. The specialty ingredients include dong quai extract, chasteberry extract, garcinia extract, uva ursi leaf powder, horse chestnut extract, alpha lipoic acid (ALA), butchers broom (root), Ostivone, grape extract (seed), deodorized garlic powder, citrus bioflavonoids, isoflavones (from soy), lycopene, lutein, and zeaxanthin five percent. Dong quai is an herbal ingredient and a relative of celery, dill, parsley, and carrots. The Chinese have been using Dong quai (also known as the “female ginseng”) for thousands of years to help ward off fatigue, increase vitality, and regulate menstrual cycles. We say it’s a great inclusion in EVL NUTRITION WOMEN’S MULTIVITAMIN. As for horse chestnut extract, it’s another herbal ingredient which helps keep varicose veins at bay, ward off free radicals and chronic venous insufficiency, increase effects of prebiotics, and speed up wound healing. For its part, Ostivone should complement EVL NUTRITION WOMEN’S MULTIVITAMIN’s 150 milligrams of calcium per serving perfectly. “Ostivone works synergistically, binding with calcium, to produce a significantly greater bone mineral density when compared to using calcium alone,” per TSI Group Ltd.’s (Ostivone’s manufacturer) official website. Since calcium is crucial for women’s long-term health, the inclusion of Ostivone should work wonders. EVL NUTRITION WOMEN’s MULTIVITAMIN’s specialty ingredients’ other health benefits include better uterine fibroid levels, vision, and fat loss, improved urinary tract, kidney, heart, and liver function; stronger bones, and balanced hormone levels. No active woman should pass up on these. Vitamin A (beta carotene and retinyl palmitate, 900 mcg: This vitamin helps improve vision and bone health. Beta cartoene also helps increase muscle growth. Vitamin C (as ascorbic acid), 250 mg: Vitamin C is more – much more – than just a remedy for the common cold. It’s a powerful antioxidant which helps keep free radicals at bay. It also helps regulate blood vessel function, promote healthy blood pressure levels, ramp up energy levels, boost vision, and improve cardiovascular function. EVL NUTRITION WOMEN’S MULTIVITAMIN’s outstanding 417 percent of the daily value for vitamin C should exceed your expectations. Vitamin D (as cholecalciferol), 15 mg: Vitamin D’s ability to strengthen bones is a crucial health benefit for women. This vitamin also helps improve heart health and regulate calcium levels in the body. EVL NUTRITION WOMEN’S MULTIVITAMIN’s solid 75 percent of the daly value for vitamin D should do the job. Vitamin E (as d-alpha tocopherol succinate), 45 mg: Vitamin E is another vital nutrient for women because of its ability to keep premenstrual syndrome at bay. Vitamin E also helps ward off free radicals, ramp up metabolism, and regulate cardiovascular function. This multivitamin has an impressive 300 percent of the daily value for vitamin E.
Vitamin K (as phytonadione), 80 mcg: This vitamin helps ward off blood clots, strengthen bones, and improve heart health. Vitamin B1 (thiamine HCl), 20 mg: This is a classic B vitamin which helps regulate cardiovascular function and increase energy levels. EVL NUTRITION WOMEN’S MULTIVITAMIN has an insane 1,667 percent of the daily value for vitamin B1. Vitamin B2 (riboflavin) 20 mg: Apart from its heart-friendly benefits, vitamin B2 also helps regulate the immune and digestive systems. This multivitamin’s incredible 1,538 percent of the daily value is a sure thing. Vitamin B3 (niacinamide), 20 mg: Vitamin B3 helps improve heart health and joint mobility. It also regulates blood pressure levels. Vitamin B6 (pyridoxine), 20 mg: This B vitamin helps boost cardiovascular, renal, nervous, and immune system function. EVL NUTRITION has a whopping 1,176 percent of the daily value for vitamin B6. Folid acid, 600 mcg: Simply known as vitamin B9, this ingredient helps women ward off birth defects and maintain healthy blood pressure levels. Folic acid also helps quell anxiety levels, keep free radicals at bay, boost heart health, and increase muscle mass. Vitamin B12 (methylcobalamin), 100 mcg: This is EVL NUTRITION WOMEN’S MULTIVITAMIN’s most abundant ingredient at an otherworldly 4,167 percent of the daily value. Vitamin B12 helps ramp up energy levels and improve cardiovascular function. Biotin, 250 mcg: Vitamin B7 helps improve nail, skin, and hair health. Biotin also helps repair muscle tissue and keep inflammation at bay. EVL NUTRITION WOMEN’S MULTIVITAMIN is teeming with biotin at 833 percent of the daily value. Vitamin B5 (calcium–d-pantothenate), 20 mg: This B vitamin helps quell anxiety, regulate immunity, increase stamina, and boost cardiovascular function. You simply can’t go wrong with 400 percent of the daily value for vitamin B5. Calcium (as calcium citrate, carbonate), 150 mg: Women need calcium to keep osteoporosis at bay. Calcium also helps regulate blood pressure levels and promote excellent cardiovascular health. This multivitamin gives you a good – not great – calcium levels at 15 percent of the daily value. Iron (as ferrous fumarate), 18 mg: Iron helps enhance cognitive function, regulate body temperature, regulate red blood cell production, and improve sleep quality. One hundred percent of the daily value for iron should do the trick. Iodine (as kelp powder), 200 mcg: This ingredient helps regulate thyroid function, stifle bacterial activity, ramp up energy levels, and improve teeth and hair health. EVL NUTRITION WOMEN’S MULTIVITAMIN has an impressive 133 percent of the daily value for iodine. Magnesium (as magnesium aspartate, oxide), 75 mg: This mineral is crucial for excellent heart health. It also helps improve sleep quality, boost bone and brain health, regulate immune system function, and ward off free radicals. Zinc (as zinc citrate), 15 mg: A versatile mineral which helps increase testosterone levels, improve sleep quality, enhance cognitive function, strengthen bones, boost immunity, and ward off freer radicals. Selenium (as l-selenomethionine), 70 mcg: This mineral helps boost immunity, keep free radicals at bay, and regulate thyroid hormone production. Copper (as copper gluconate), 2 mg: Copper helps improve mental function, increase energy levels, and regulate iron absorption. EVL NUTRITION WOMEN’S MULTIVITAMIN contains an impressive 222 percent of the daily value for copper. Manganese (as manganese gluconate), 5 mg: Manganese helps keep free radicals at bay, boost digestion and thyroid function, and regulate blood sugar levels. Chromium (as chromium polynicotinate), 120 mg: This mineral helps keep bad (LDL) cholesterol levels in check, improve eyesight, and promote healthy blood pressure and blood sugar levels. Molybdenum (as molybdenum amino acid chelate), 70 mcg: A trace mineral which helps keep free radicals at bay, boost dental health, and facilitate the elimination of waste products. Dong quai extract (root)(Angelica sinensis), 80 mg: This herbal ingredient helps women balance hormone levels and keep postmenstrual syndrome at bay. It also helps ward off free radicals, boost circulation, improve sexual function, and improve joint health. Chasteberry extract (fruit)(Vitex agnus–castus), 50 mg: Chasteberry extract helps keep PMS at bay, improve fertility, balance estrogen and progesterone levels, and regulate uterine fibroid levels. Garcinia extract (fruit)(Garcinia cambogia)(standardized to 50 percent HCA), 50 mg: This Southeast Asian fruit helps increase fat loss, regulate blood pressure levels, keep cholesterol levels in check, and enhance immunity. Uva ursi leaf powder, 50 mg: This herb helps boost liver, kidney, and urinary tract health. Horse chestnut extract (Aesulcus hippocastanum)(seed)(standardized to 20 percent aescin), 25 mg: This component helps boost vein health and circulation, ward off inflammation, and enhance fertility. Alpha lipoic acid, 20 mg: Simply known as ALA, this is a powerful antioxidant which stifles free radical activity. It also helps enhance the benefits of vitamins C and E.
Butchers broom (root)(Ruscus aculeatus), 15 mg: This herb helps keep hemorrhoids and varicose veins at bay. Ostivone (as isopropyl isoflavone), 10 mg: This bioflavonoid helps boost calcium absorption and strengthen bones. Grape extract (seed)(standardized to 95 percent polyphenols), 10 mg: This ingredient helps regulate blood pressure and blood sugar levels, boost heart health, and strengthen bones. Deodorized garlic powder, 10 mg: Garlic helps regulate digestion, promote healthy blood pressure and cholesterol levels, and improve cardiovascular function. Citrus bioflavonoids, 10 mg: These fruit-derived components help ward off free radicals, viruses, and inflammation. Isoflavones (from soy), 2 mg: These are organic compounds which help keep free radicals at bay, balance hormone levels, and promote healthy blood cholesterol and blood pressure levels. Lycopene, 250 mcg: This natural ingredient from tomatoes helps improve vision, stifle free radical activity, and boost cardiovascular function. Lutein, 250 mcg: This popular vision supplement ingredient helps offset the negative effects of sunlight overexposure and poor nutrition on ocular function. Zeaxanthin five percent, 18.7 mcg: Zeaxanthin is a part of the macula (a part of the retina which helps regulate central vision) which helps shield the eyes from direct sun exposure. The manufacturer dubbed EVL NUTRITION WOMEN’S MULTIVITAMIN the “High-Performance Multivitamin.” After a thorough analysis, we agree with that claim. First off, this supplement has solid levels of the essential vitamins and minerals for women. We’re talking about 75 percent of the daily value for vitamin D, 100 percent of the daily value for iron, 100 percent of the daily value for vitamin A, 300 percent of the daily value for vitamin E, and 136 percent of the daily value for zinc. The calcium level (15 percent of the daily value) isn’t so bad, but it doesn’t measure up to the likes of 21st Century Mega Multi For Women (50 percent of the daily value). If you’re keen on higher levels of these nutrients, 21st Century Mega Multi For Women is the better alternative. Active women (especially athletes) need sufficient doses of B vitamins for increased energy levels and better cardiovascular function. EVL NUTRITION WOMEN’S MULTIVITAMIN’s B vitamin arsenal isn’t far off from those of leading athlete multivitamins. Like we said, it has an insane 4,167 percent of the daily value for vitamin B12 (methylcobalamin). To help ease your transition during pregnancy, this product has a solid 150 percent of the daily value for folic acid. In terms of EVL NUTRITION WOMEN’S MULTIVITAMIN’s specialty ingredients, we found a striking resemblance between them and those of Optimum Nutrition Opti-Women (which we consider as one of the most versatile women’s multivitamins on the market). One can’t help but wonder if EVL NUTRITION WOMEN’S MULTIVITAMIN is a mere spin-off (the components from dong quai extract to zeaxanthin are almost identical). Nevertheless, it features the key nutrients for optimum women’s health. Customers have also been raving about EVL NUTRITION WOMEN’S MULTIVITAMIN. They say it exceeded their expectations. We know it will exceed yours, too. We also give the manufacturer props for excellent transparency. It breaks down all of the ingredient amounts. You won’t find any shady proprietary blends in EVL NUTRITION WOMEN’S MULTIVITAMIN. Just about the only downside is the possible inclusion of fillers or dirty ingredients. We didn’t find any “All-Natural” or “GMP” label on EVL NUTRITION WOMEN’s MULTIVITAMIN. This could be a dead giveaway (many of the manufacturer’s products such as EVLUTION NUTRITION LEAN BCAA are great, but include fillers. We’re not surprised.). Nonetheless, EVL NUTRITION WOMEN’S MULTIVITAMIN seems to be an up-and-coming player in the bodybuilding supplement industry. It should give other women’s multivitamins a run for their money. Make it a part of your supplement stack and feel the difference today. We agree with all of these claims. EVL NUTRITION WOMEN’S MULTIVITAMIN should help women achieve their long-term fitness goals. The manufacturer intended EVL NUTRITION WOMEN’S MULTIVITAMIN for women who are at least 18 years of age who want to fill nutrition gaps, achieve their daily fitness goals, and boost overall health. EVL NUTRITION WOMEN’S MULTIVITAMIN contains 125 percent of the daily value for vitamin B3 (niacinamide), which may cause skin flushing and nausea, per the Mayo Clinic’s official website. This supplement also has 25 milligrams of horse chestnut extract (Aesulcus hippocastanum) (seed)(standardized to 50 percent HCA) per serving. This component may cause itchiness, nausea, headache, upset stomach, and muscle spasms. If these, or any other ingredient, make you feel doubtful, please consult your doctor before buying EVL NUTRITION WOMEN’S MULTIVITAMIN. Impressive ingredients. Contains just about every micronutrient essential for women’s health. Solid calcium, vitamin D, iron, vitamin A, vitamin E, and zinc levels. Vitamins and minerals which the active woman needs. B vitamin arsenal. Not the highest levels among women’s multivitamins, but solid, nonetheless. Specialty ingredients. Fifteen additional components from dong quai to zeaxanthin. Awesome reputation. Ladies have been raving about this product online. Possible inclusion of synthetic ingredients. We didn’t find any “All-Natural” or “GMP” label on this product. If you want a high-performance multivitamin for women, EVL NUTRITION WOMEN’S MULTIVITAMIN should fit the bill nicely. Its comprehensiveness should help the modern woman achieve her fitness goals, and then some. We recommend you buy EVL NUTRITION WOMEN’S MULTIVITAMIN. It should complement your lifestyle perfectly.